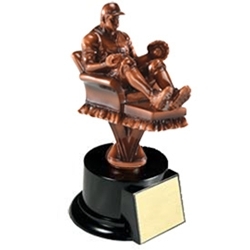 Fantasy Baseball Armchair Trophy. This is the ultimate fantasy baseball trophy for a first place performance or league champion. Includes bronze resin fantasy baseball figure mounted on a weighted synthetic base. Total height 7.5". Personalization Size 2.5" wide x 2" tall.